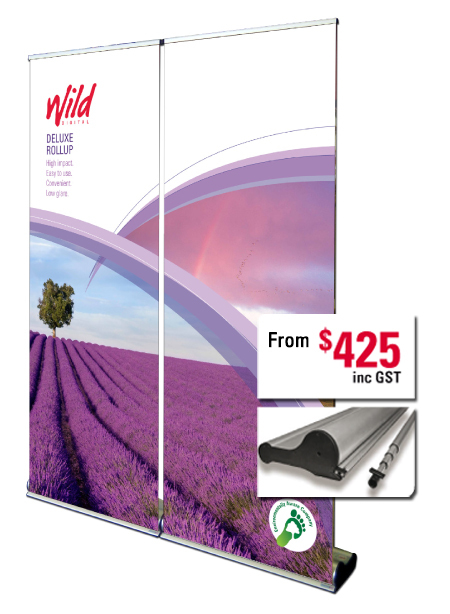 Wild Digital - Deluxe Rollup - retractable pull-up bannerstand. The Deluxe Rollup bannerstand is easy to use and makes a fantastic impact wherever you take it. This rollup combines our top of the range base unit with our highest resolution print. The high resolution print is especially suitable if your graphics contain small text, fine lines and subtle blends. The Deluxe rollup features flush mounted magnetic blocks in the base and top rail and a graphic nearly as wide as the base. Connect as many as you like to make one big display. The Deluxe Rollup features a telescopic pole that allows graphics to be displayed at any height between 840mm to 2300mm. Size: 845mm wide. Also available in 1000mm, 1200mm & 1500mm wide. Height can be any length from 840mm to 2140mm. Included Extras: Padded carrybag with full length zip. Price: From $425 (inc GST).